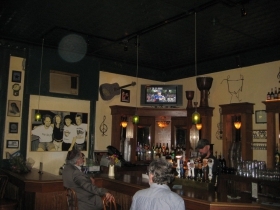 The Riverwest bar, built in 1902, has a stage musicians like and authentically historic atmosphere. The bar. Photo by Michael Horne. This purpose-built tavern of substantial masonry construction has anchored the southeast corner of N. Weil and E. Locust streets since 1902. Since 1993 it has been the home of Linneman’s Riverwest Inn, where some form of live entertainment is offered nearly every night of the week. The tavern maintains print and online calendars to sort it all out. Linneman’s is one of the few Riverwest bars resisting the urge to open early. Its doors open at 8 p.m., except Monday, when the tavern’s business begins at 7 p.m. with the long-running Poet’s Monday series hosted by Timothy Kloss. Most music shows begin at 10 p.m. The 2,210 square foot tavern, with a capacity of 160, is in two distinct sections. The front, with its high tin ceiling, has modern glass lighting fixtures above the bar. The bar is decorated with some lovely vintage pendant fixtures set in front of vintage mirrors. The ceiling is painted Forest green, as is the generous wainscoting. The walls are white, and very sparsely and selectively decorated, including a large photograph of the building in winter. 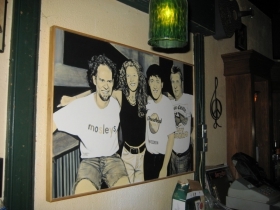 A painting of the Mosleys by band member Mike Fredrickson (left). Photo by Michael Horne. One prominent feature is a painting of the band The Moselys, painted by Mike Fredrickson, a member of the band who is also a prolific painter of Riverwest scenes and Milwaukee cultural life as well as a frequent performer here. 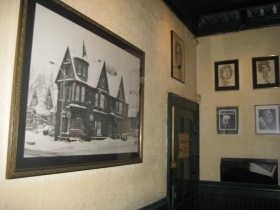 A Fredrickson portrait of a young Bob Dylan joins a few other rock figures on the bar’s west wall, which is punctured by two large windows. The only commercial sign is a tin Lakefront Brewery sign, and a neon Pabst sign that glows outward to busy Locust St. The tavern offers 10 beers on tap, dispensed from a newly installed brass “pass-through” beer tower that uses cold air to maintain ideal beer temperature. Taps include Guinness, Hacker-Pschorr Weisse, Riverwest Stein, Lakefront IPA, Spotted Cow, Miller Lite and Pabst. A bottle of PBR will run you $3. Beside the corner entrance is an old-school announcement board of the sort you used to see in hotel lobbies. It is kept scrupulously up to date with the name of the daily entertainment. A classic brass lamp lights it and a sign below this prohibits firearms in the club. So, don’t pack your guns, but feel free to instead bring any disputes to owner Jim Linneman, 59, a former all-conference fullback and linebacker, in 1972 the leading scorer in the North Shore conference and UPI 2nd team all-state linebacker. That was back in his days at Whitefish Bay High School, and before he became a television news reporter in Wausau. “God, I hated Wausau,” Linneman says. So, 21 years ago he opened this bar, just across from Klinger’s (30+ years) and The Tracks (40+ years). 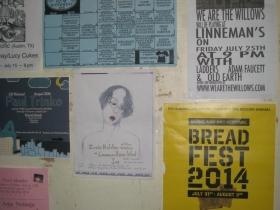 Linneman is all over his bar and neighborhood. He lives above in one of the two apartments in the 4,420 square foot building, assessed at $220,000 (up from $164,000 last year). He is forever walking around his corner, keeping an eye on things — most recently printing out posters and searching for Gordo, a missing 15-year old neighborhood cat. Linneman also printed a sign for the owners of Tuk’s Thai Kitchen, a soon-to-open restaurant across the street. That building has been a vexing one in the neighborhood. Most recently it was Angelo’s, an Italian to-go pizza joint whose owners have been charged with multiple crack-and-alcohol induced arsons in Glendale. Linneman’s private domain in the tavern is the size of a Riverwest closet. 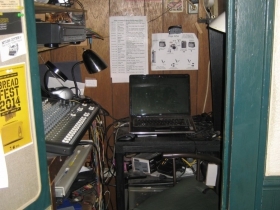 Here is the nerve center of the Linneman’s music production system — a little box of a room stuffed with sound equipment and computer monitors. Whether the entertainment is some bluegrass guys fiddling around, or a poet overdosing on Bukowsky, Linneman works the board as intently as if he were mixing a stadium concert for Pink Floyd. This windowless cell faces the back room, the second of the tavern’s two areas. Like the front hall, it has two large windows overlooking Weil St. It also has a tall ceiling, this one wood, and like its neighbor is painted Forest green, as is the wainscoting. There is absolutely nothing hanging on the white walls. A portion of the room is carpeted, also in a deep green shade. It is the closest Riverwest gets to country club decor. The room has 14 formica-topped tables and sturdy, comfy, second-hand padded bentwood chairs. Bench seating occupies the west wall. The highlight of the room is a fair-sized stage, four steps up from the main hall, and occupying the south end of the building. 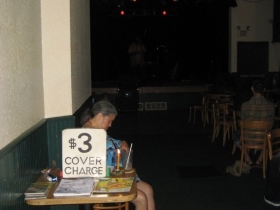 The stage was a 2003 addition to the building that also brought handicap access to the tavern. It cost a good $180,000 to build, Linneman says, and, from the outside and inside it is a seamless addition, retaining that Old World charm so integral to the neighborhood. One reason musicians like to perform at Linneman’s is the backstage area. Steps in the rear of the stage lead downstairs where musicians have a little lounge, a bathroom, a place to store their gear, and a tapper dispensing free beer. Charming. Description: Early 20th Century corner tap on busy street, neighborhood bar as concert, performance venue, architecturally and culturally significant. Capacity: 160 in 2,210 square feet. Restrooms: One men’s, one women’s and one in the basement for musicians. Year Building Constructed: 1902. On the same block as Ma Baensch’s Herring Co. Estimated Annual Rent: $19,492 at $8.82 per square foot by city assessor’s calculation. Two apartments above, including one for tavern / building owner. Linneman’s is the heart and sole of Riverwest. This well written piece is a great tribute to Marty and Jimbo who have dedicated their lives to local music and who’s establishment gives this city its edge that it needs.